This was my first ever AtSiP conference, my former Principle Technician, Kit Jordan, attended one at least 5 years ago but she did not find it helpful so I never really bothered about attending. However, this year with all the changes in Psychology here at UCLan and the introduction of new imaging equipment and a new Brain Imaging laboratory, I felt that it was important that I attend the conference to network with Psychology Technicians from other Universities to see what their schools and departments are doing. Also, it is always good to listen others experiences and also it is interesting to look around other Departments/ school to see how they do things and what equipment they have. As I was giving a talk at the conference AtSiP paid for me to attend, this was very kind of them as they only paid for one other person, who was presenting a poster. This covered conference fees, accommodation and all the food too- including two very nice meals out! My talk was a success and I was asked a lot of questions afterwards at meal times and when networking about the equipment that I spoke about and also about my experiences of doing a PhD part-time while working full-time as a technician- I was asked this mainly by younger technicians, but also by one older technician and he is expected to spend 40% of his time doing his own empirical research even though he is a school teaching technician. The conference was at Staffordshire University in Stoke and they have a brand new science centre, which was very impressive. It has state of the art lab facilities and reminds me of when we moved into Darwin Building in 2006, everything was new and shiny! The School of Psychology had a purpose built suite of labs, all equipped with hidden cameras and an audio speaker system so that the experimenter need not interact with the participant. The suite also had a separate kitchen and shower room and it incorporated both brain imaging and psychophysiology. As well as this their general labs had hidden cameras and audio systems in them too and the control room for these was also their control room for their child / observation suite. The technicians had designed/ had a large input into the design of these laboratories and they were quite impressive (but they are new). 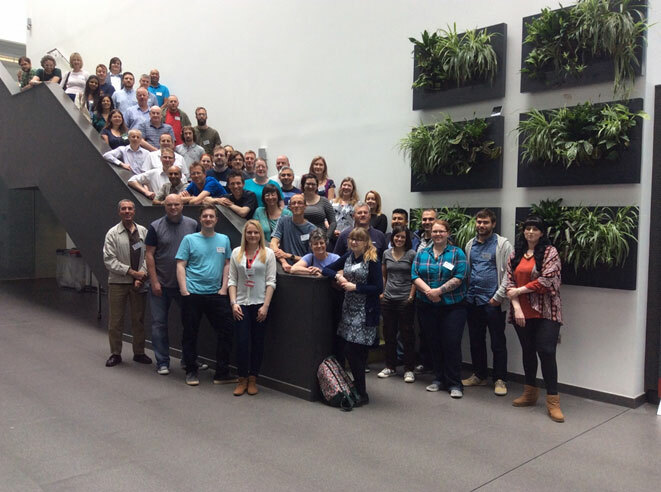 This year the conference had the best ever attendance with over 50 Psychology technicians attending. There were also sales reps at the conference and interestingly, we have equipment in the School supplied by every one of them! The conference consisted of one stream of talks, most of which were of a very practical nature (rarely encountered at academic conferences); these gave me lots of new ideas and food for thought. There was the opportunity to try out a variety of Eye trackers from SMI- although our eye trackers are not supplied by them it was useful to be able to compare them and get feedback from people who use these or use the same ones that we have. There was also a talk on eye trackers that only cost £99 the quality of data that they generate apparently compares well with the higher end £20- 70,000 ones! These might be something to look into for use on applicant days and in undergraduate lab classes as it will not matter if the settings are altered. There was a brilliant talk on the use of Microsoft Kinect v2 and gesture recognition (cost only £169) and again might be something that would enhance undergraduate lab classes and applicant/ open days. There was also a demo of wireless equipment that integrates with the Biopac and this would improve our health suite set up (cost £1500 approx. for two amplifiers- we would need two of these for basic psychophysiological work). There were some very interesting talks on research that technicians do as part of their job, they seem, in some universities, to be valued members of research staff with their own unique research area. 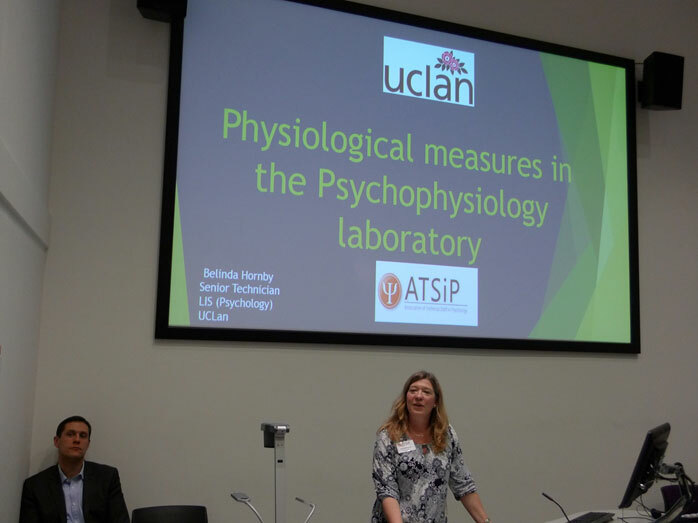 There were also talks about how Psychology technicians are perceived and the ways in which students and staff would like us to work in order to support their work (I found these talks to be quite thought provoking as they had some quite novel ideas). There was a very interesting talk given by the Dean of Psychology about the progression of HE in the UK and how we are likely to end up with the ‘uber’ universities similar to the ones in places like China. Networking proved to be successful too, with a contact who is going to see if he can help to fix one of our older eye trackers, that although older does have some advantages over some of the newer ones when collecting data from school children. Also, I was given training materials for the EEG equipment and software that we currently use, which although not the newest version (training for this is not free) is the version that we currently use. It was good to network with the Black box Ltd. Managing director as it turns out that we have a Black box set up in the school that is currently not set up and not being used, I am now looking into helping to get this up and running. I have also arranged for the people who sold us the Biopac VR system to come and help us get the camera side of the system working as it should be, this is something that we have struggled with but now that we are getting the latest version of the software, and we have upgraded a lot of the system recently we should see some progress over the summer with this. Also, the occulus rift is going to be integrated into this rather than the current eMagin stereoscopic glasses. I am hoping to meet up with some of the technician contacts that I made (although we are all busy and have good intentions so will see how this goes) but it is good to be able to put faces to names from the mailing list and I think the human contact means that people are more willing to help and advise (not that they aren’t anyway to anyone who emails I find Psychology technicians are quite a friendly group of people! ).